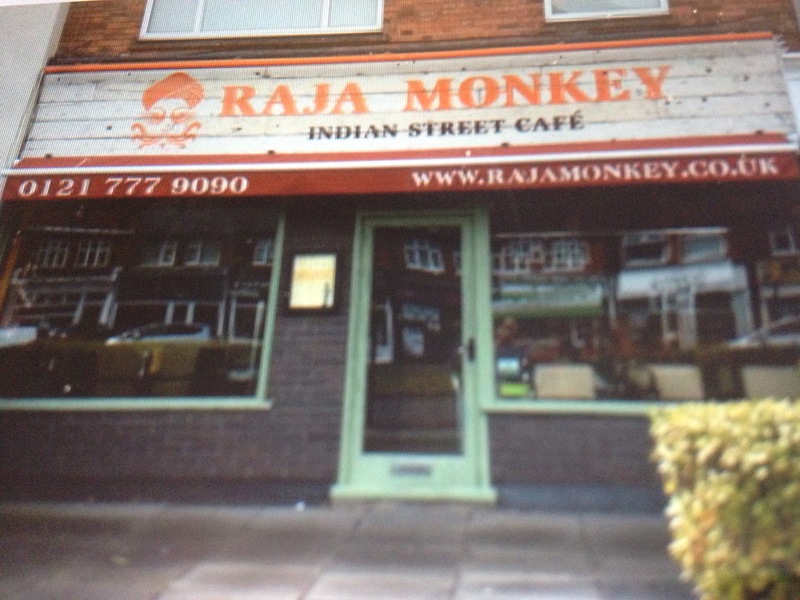 Raja Monkey is in Hall Green in the south part of Birmingham. It’s the small brother in the Lasan Group which includes award winning Lasan and Argentinian Fiesta Del Asada. It’s based on the true indian road cafe that is found traditionally providing soul food around the old atmospheric streets of India. It’s rustic, colourful, and vibrant filled with a cosy charm of charming service and delicious harmonious cooking aromas. It has a relaxed feel, like a cafe with a difference, you can feel the quality of the cooking just by being there and knowing the Lasan reputation. You notice the open kitchen with chefs making dosas, and content in their craft. It makes for a fun atmosphere, making you feel almost part of the kitchen. 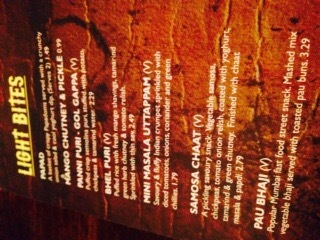 The menu includes traditional street food, Dosa’s, Thali’s and snack like starters, ideal for grazing. For vegetarians it’s paradise, with so many tempting dishes to choose from. The restaurant is on the Stratford Road opposite Waitrose in Hall Green nestled amongst a few shops. On a midweek night Ruth and I braved the snowy air and the freezing temperatures and walked into Raja Monkey to find a cosy and warm hearted place. We had never eaten inside the restaurant before, but had enjoyed numerous take aways since it opened. 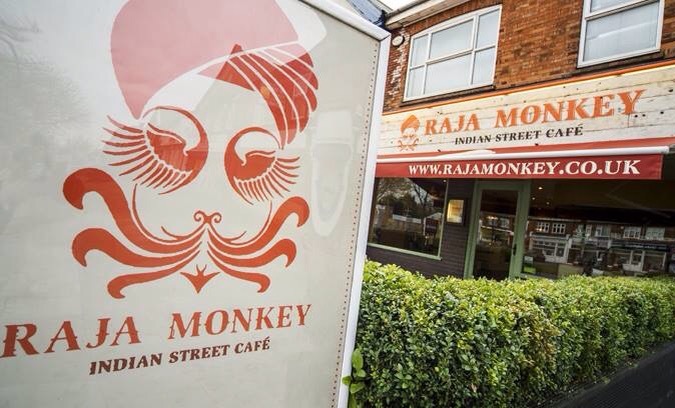 In fact we’ve raved about the quality of Raja Monkey’s take aways to anyone that would listen, it’s our go to take away in South Birmingham. 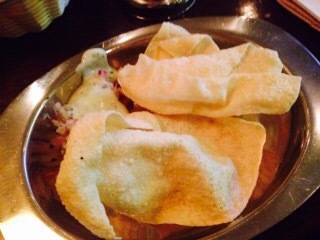 In order to test the quality we both ordered Papads (poppudums) to nibble on. They were crisp and fresh. 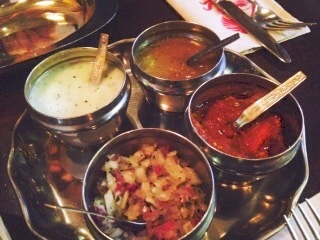 The chutney and pickles that accompanied them were excellent, a good selection including a cool yoghurt dip all presented in tiny silver pots with lids on- very sweet. 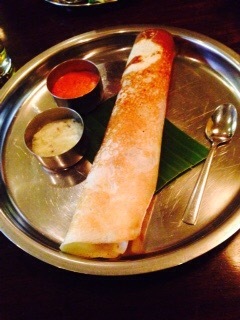 A Dosa is a popular Southern Indian savoury street food fermented crepe created from rice, butter, and lentils stuffed with a filling of choice meat or veg and served with coconut chutney. The Masala Aloo Dosa was filled with crushed potatoes fragranced with turmeric, mustard seeds with curry leaves and wrapped in a delicious crepe. Ruth loved her Dosa, hot off the griddle, made in front of your eyes, it had a good balance of flavours, crispy, nutty, and was well recommended. 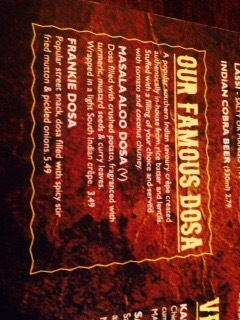 I chose the Samosa Chaat. A pickling savoury snack of a vegetable samosa, chick peas, tomato, onion relish, coated with yoghurt, tamarind and green chutney and finished with chaat masala and Papdi. The flavours and textures of this dish were lovely. The layers of samosa deconstructed almost and lightly meshed into the chick peas, yoghurt and chutney felt so like Indian street food that the sounds and atmosphere of India filled this tiny corner of Hall Green and warmed the cockles of my heart. 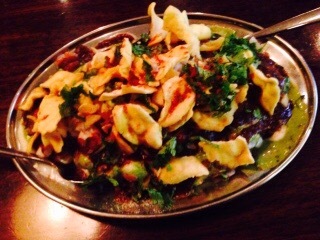 I can’t praise the Samosa Chaat enough. So very very good. 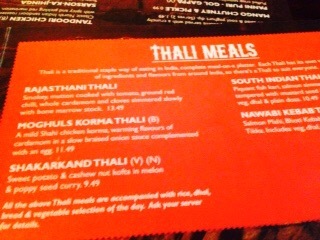 For our next course we both chose to order the house speciality The Thali. 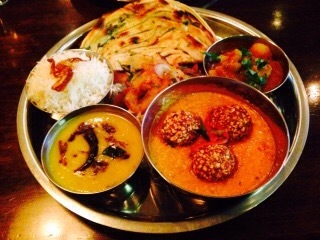 A Thali meaning plate, comprised of a selection of various dishes served on a silver platter compartmentalised so that you can either eat them as you see them in turn or you can tip the small platters into the larger platter and eat them as a normal curry. The choice is yours. We did both. 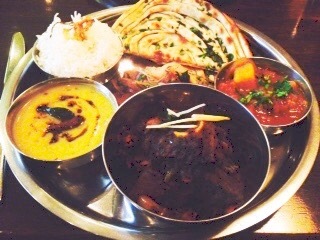 Ruth chose the Rajosthali mutton thali. She loved it, I can tell as she went quiet-as she was eating. 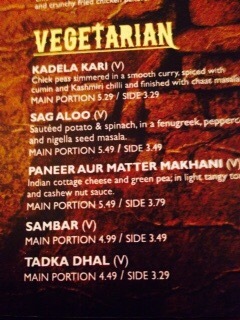 I chose the vegetarian thali called the Shakarkand thali. 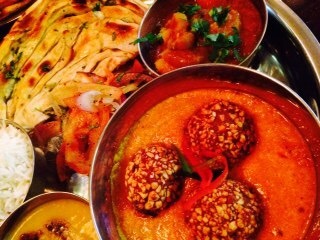 The centrepiece was the potato and cashew nut kofta. 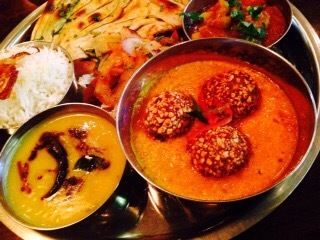 Heavenly succulent balls of sweet, potato, against the spice of the poppy seed and melon curry , lovely, a divine marriage of sweet and hot flavours. A warming curry for a cold night. Alongside there was a deliciously soothing Dhal, a fenugreek and coriander Paratha (a flatbread) from South Asia which when cooked is layered. Lovely, a stunningly flavoured bread. Then a veggie curry that was spicy, and an excellent accompaniment. I loved this way of eating food. We both had room for pudding, well who can’t resist a creamy home made Indian pudding. 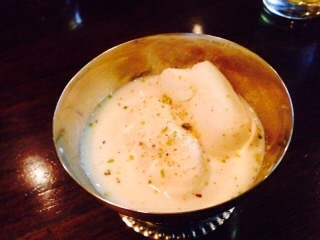 We both love Rasmalai and we were pleased it was on the menu. You can almost describe it as a cheese cake without the biscuit layer or cottage cheese or soft paneer cheese balls. It was lovely, cooling, fresh, the kind of pud you can fall in love with. The soft cheese immersed in chilled sweet creamy milk. 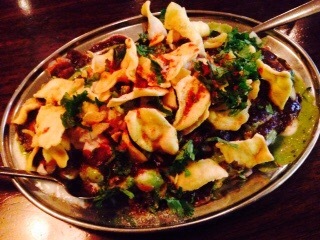 Raja Monkey shares with Lasan a commitment to quality ingredients and soulful cooking, less fancy, more street, but for good value, comfort Indian soul food it can’t be beat. For vegetarians it’s a must. So many dishes to choose. 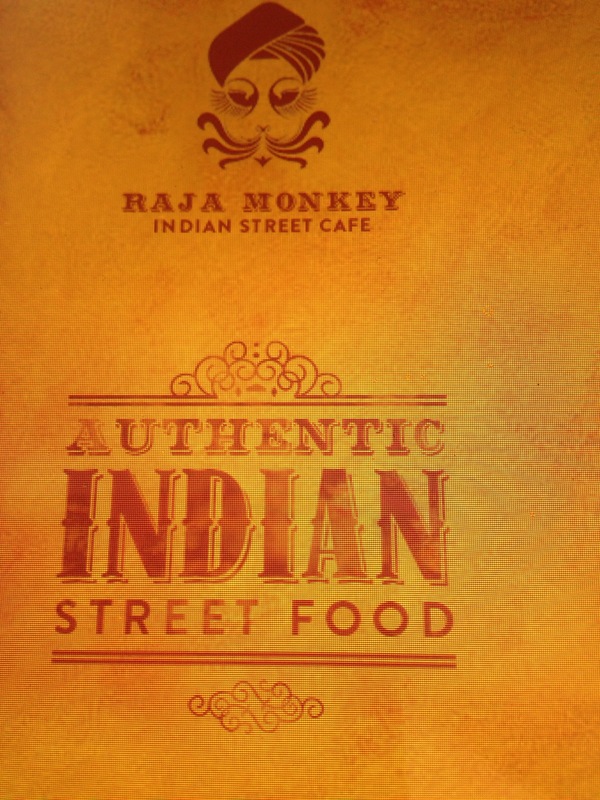 From experience of Raja Monkey’s takeaways and from this meal all veggie dishes are recommended. The service was attentive, informal, but with a keenness to explain the dishes and served with a passion and pride that is genuine. 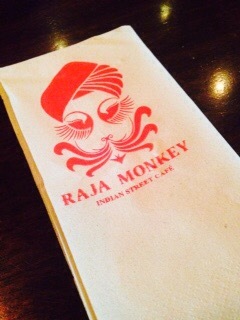 Raja Monkey provided Ruth and I with a highly enjoyable meal, Central heating on a cold night. Raja Monkey is one to return to again and again, without hesitation. Bravo. 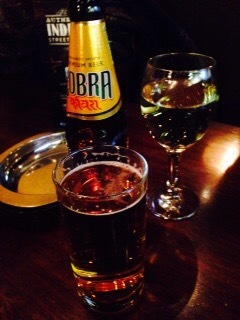 We also ordered 2 bottles of Cobra beer and 2 glasses of Sauvignon Blanc and two delicious espressos. The food looks so good here. 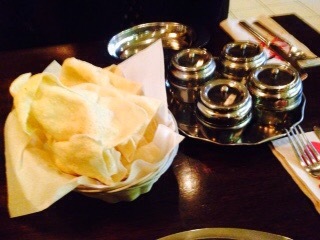 I need to get to Hall Green, it’s not even that far 🙂 Even the poppadoms look great!